Replacement filter for your 14.9, 14.12, 14.14,15.15 and 16.16 Dellorto SHA. Includes the screen, cap and clip. From your friends at C.R.A.P - Cloned Reproduction Awful Parts a 15mm bing copy. We got it here just in case you're into that kind of thing. Half the price of the original twice the chance it'll piss you off. OMG brand petcock for puch maxi, puch newport and Vespa Ciao. 12mm x 1mm female thread coupling nut. 1mm thick reducing shim for dellorto carburetors. Only works with 15.15 and 16.16 carbs. Authentic Dellorto SHA made in Italy. Awesome upgrade carb for most bikes. Slap this on your motobecane, peugeot, puch, minarelli, garelli, sachs, morini or tomos and forget about it. This is the click choke version. 16mm x 1mm puch magnum petcock. 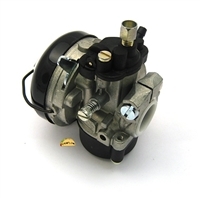 New 15mm bing carburetor for puch mopeds, Upgrade from your stock carb! OMG brand petcock for motobecane mopeds. Left side flow = faces the carb = easy livin. High flowing performance enhancing speed crushing metal mesh air filter for bing carbs. 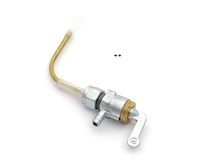 Fits your 12mm, 14mm or 15mm bing carburetor. You may have to bore out the ID a little for an easier fit or just jam it on. High flowing performance enhancing speed crushing blue foam air filter for bing carbs. Fits your 12mm, 14mm or 15mm bing carburetor. You may have to bore out the ID a little for an easier fit or just jam it on. High flowing performance enhancing speed crushing red foam air filter for bing carbs. Fits your 12mm, 14mm or 15mm bing carburetor. You may have to bore out the ID a little for an easier fit or just jam it on. Float needle for 12mm - 15mm bing carburetors. 5mm Dellorto main jets in the 70's range: 70, 72, 74, 76, 78. For use in all SHA and PHBG carbs. 5mm Dellorto main jets in the 80's range: 80, 82, 84, 86, 88. For use in all SHA and PHBG carbs. 10mm x 1mm straight flow petcock. Works on Peugeot and Motobecane and also some italian gas tanks. Take note you may have some clearance issues on MBK with the outlet nozzle coming close to the pulley. golden puch maxi petcock for all puch maxi & newport mopeds! Authentic Dellorto SHA made in Italy. Awesome upgrade carb for most bikes. Slap this on your motobecane, peugeot, puch, minarelli, garelli, sachs, morini or tomos and forget about it. this is the lever choke version. comes jetted at 57 main usually! OMG brand petcock for motobecane av88 model mopeds. This is a push-pull valve with 8mm x 1mm threads, for 5mm fuel line. Stage6 R/T Carburetor, 21mm - scooter tech brought to the world of mopeds! 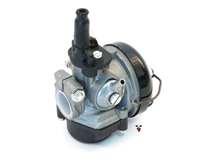 Impressive-looking in black finish, the Stage6 R/T series carburetors are manufactured with extreme precision to ensure proper air and fuel flow throughout. 28mm ID metal mesh air filter for Dellorto PHBG carbs. This has a 90 degree bend in it. Perfect for those tight spaces! Catch all the crud with these internal banjo filters for Dellorto SHA carbs. Fits 14-16mm carbs. Stock air box for square bing carburetors, commonly found on Sachs 504 and 505 engines. Airbox adapter kit for Sachs 504 and 505 stock airbox assemblies. Comes with the airbox adapter box, choke slide, choke spring, choke plate, an o-ring and four screws for mounting it to the carburetor. Used, kinda crusty original air box filter for any Derbi that's using the original SHA carb. These will clean up super nice and they all have the original foam element. Round throttle slide for 12mm, 14mm and 15mm round bing carburetors. Aftermarket stock Puch airbox filter for your 12mm, 14mm or 15mm bing carburetor. PHBG metal mesh air filter. These fit on Dellorto PHVA and PHBG with the screw on adapter. Replacement metal float pin for Dellorto PHVA carburetors. Super shorty compact air filter for all Dellorto SHA carbs. Comes with a hose clamp. Stage6 R/T Carburetor, 24mm - scooter tech brought to the world of mopeds! Impressive-looking in black finish, the Stage6 R/T series carburetors are manufactured with extreme precision to ensure proper air and fuel flow throughout.